Thatch as a building material makes life a bit more interesting when building regulations need to be adhered to. Find Specialists to help you on our Thatch Directory. External fire spread – Distance from Boundary B4 10.9. A – The rafters are overdrawn with construction having not less than 30 minutes fire resistance. B – The guidance in Approved Document J (Combustion appliances and fuel storage) is followed. C – The smoke alarm installation extends into the roof space. There are Models eg Thatch-Safe Model and Dorset Model which are ways to meet this B4 building regulation. Please be very aware of products which are sold which do not meet this regulation. Fire resistance is both fire integrity and insulation. The timbers (roof) must therefore be covered with such a material as to give both flame and heat protection for the allocated time. Flame barriers which give no insulation are not sufficient. Please see recent information from Senior Building Control Surveyors on this point. Understand what products you are being offered and what tests they have achieved and if those tests are appropriate for the installation you want. Building Regulations limit the use of combustible roof coverings; typically thatch should be at least 6 metres from the boundary for detached buildings less than 1500 cubic metres volume and/or small semi-detached houses, or 12m in other cases. However, Approved Document B to the regulations allows Building Control Bodies to consider reduced distances to boundaries if certain conditions are met, including provision of a half hour fire resistant layer between the thatch and rafters. It is important to note that the regulations refer to construction having “not less than 30 minutes fire resistance”. In the context of Building Regulations, fire resistance means a material tested to recognised standards for 3 criteria; insulation, integrity and stability. For the layer between thatch and the rafters, the material must have at least half hour fire resistance for insulation and integrity. When considering a material for the fire resistant layer, whether for Building Regulations, insurance or just peace of mind, it is vital that the supplier can confirm that their material has been tested to BS 476 Parts 20/22 (or recognised European equivalents) and achieved at least half an hour’s insulation as well as integrity. There are products being marketed as “fire barriers” and quoting periods of fire resistance or fire protection, but when pressed, the suppliers cannot confirm that the insulation standard has been met by their product, or the tests applied have been inappropriate. Some insurance companies are offering reduced premiums to properties with fire barriers installed but their advice is also sometimes confusing. Please understand what protection is available and what the options are. The guidance in this Approved Document provides a way of ensuring that combustion appliances can function safely. For combustion appliances to continue to work safely and effectively it is essential that they are adequately and regularly serviced and maintained. 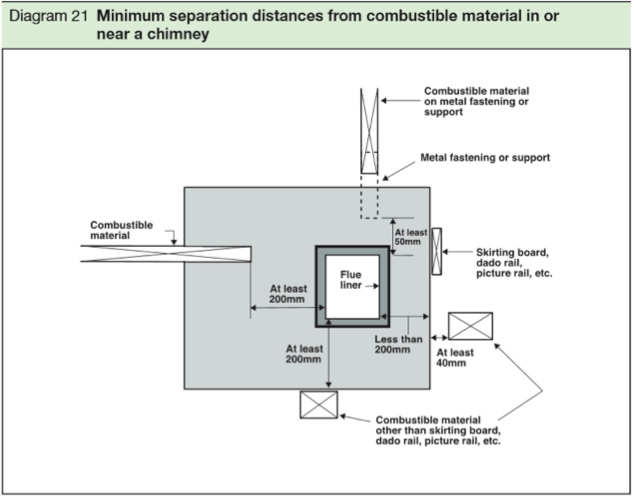 Diagram 21 details the minimum separation distances from combustible material in or near a chimney. It assumes that the combustible material is timber (not thatch). Changing use of an existing chimney is also covered by this document eg if you are looking to install a woodburner, 1.36 – 1.39 apply. Also, check with Appendix E (of Approved Document J) on such an installation. Do not rely on Approved Document J and the 200mm gap on an existing thatched property, look at your individual chimney and flue liner and make an informed decision. 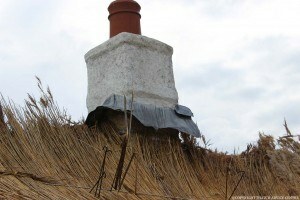 The Thatch Advice Centre recommends that you never use a flexible liner for wood-burners in thatched properties. Clay liners comply with Building Regulations and are recommended by the Thatch Advice Centre. The building regulations are there to help build in a safe way. Once built, the most important things to reduce the thatch fire risk (per Forensic report on Causes of 103 thatch fires) is to have a sound chimney (lined correctly if required) burn seasoned wood, take care within the first 30 mins of lighting a fire and have a chimney of good height. The use of Fire retardant sprays eg Magma Firestop help to reduce the risk of thatch catching fire in the first place. In Europe these form part of the building legislation but this is not currently the case in the UK.